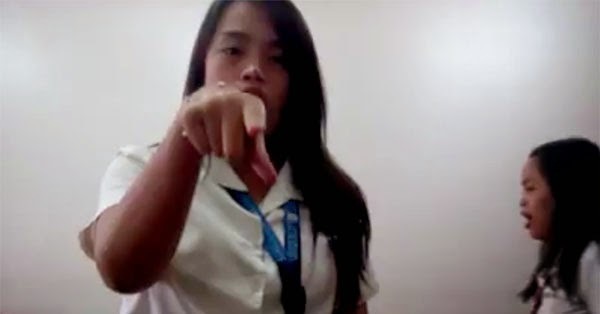 This creepy video shows a smartphone camera following the movements of two students inside their classroom at University of San Carlos in Cebu. We were supposed to have our pre final exam in Ac508 when classes were suspended due to the heavy rain. Unfortunately, Soley and I were at the campus already when we received the news. Since it was still raining hard, we decided to go to our room GR450. There weren't much of people there because it was a 7:30 AM class. Due to boredom inside the classroom, we decided to fool around and make some covers and videos. Hours later, Ondo, one of our classmates, arrived and decided to stay and have fun with us. We had a number of videos before this. When we took this one, I placed my phone on the table facing us with a bag at the back of it for support. You can see we had fun at the beginning of the video when something creepy occurred. I noticed that the camera seem to follow my movement (during the bridge part of the song) like someone was holding it. So I called the attention of my friend who didn’t seem to understand my point. I thought it was just my phone or the shaking of the table but it wasn’t. The three of us watched the video for the first time and we felt that something wasn’t right so we decided to leave. After watching the video countless times, we noticed a shadow passed by the chair that was facing the white board.. Who could that shadow be when it was only the three of us who were inside the room at that moment? We found out that Avila's smartphone is a Cherry Mobile Omega XL. It has a 13-megapixel rear camera and 8-MP front camera, but doesn't have a motion detection feature for video. Notice that the camera follows Avila's head and body whether the direction is upwards, downwards, or sideways. Do you think something or someone invisible was holding it?